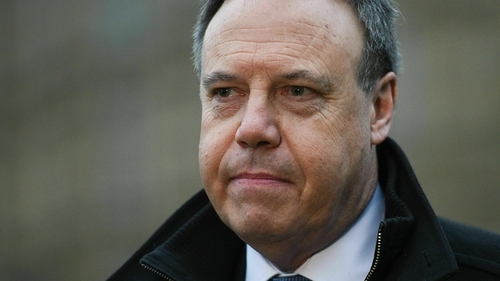 Deputy leader Nigel Dodds said the EU's resistance to amending the Withdrawal Agreement must be challenged by UK Prime Minister, Theresa May. Mr Dodds said his party had "consistently and repeatedly" made it clear it will not support the deal until the construction of the contentious backstop protocol is changed. Reacting after the Withdrawal Agreement was defeated for the third time in the Commons, the North Belfast MP said: "We have reached this view from a principled position, as we do not believe the Withdrawal Agreement is the best way forward for the United Kingdom. "In those circumstances, there is the strong possibility that we could have a long-term outcome whereby Northern Ireland would inevitably pull away from its biggest trading market in Great Britain as there would be new internal barriers within the United Kingdom." Activated if a wider EU/UK trade deal fails to materialise before the end of the Brexit implementation period, the backstop would see the UK enter into a temporary customs union with the EU - to avoid the need for customs checks on the Irish border. It would also see Northern Ireland adhere to EU single market rules on goods - again to rule out the necessity for border regulatory checks. The DUP believes binding Northern Ireland to single market rules would create a regulatory border between the region and the rest of the UK - a move, it contends, that would undermine the constitutional integrity of the Union. The party has not been convinced by Theresa May's efforts to provide reassurances on the backstop. Mrs May secured a number of legal add-ons to the agreement from the EU - documents the government insisted provided assurances around the temporary nature of the measure and over potential routes to exit it. She has also pledged to use domestic law to beef up Stormont's role on backstop matters and has made commitments that the rest of the UK will not diverge from the EU regulations applied in Northern Ireland. "In our recent discussions with the government, good progress has been made on how domestic legislation would assist in ensuring the economic integrity of the UK as a whole and recognising Northern Ireland's particular situation sharing a land border with the European Union," he said. However, according to the DUP deputy leader, "sufficient progress has not been made". "For our part, we will continue to use our position and influence within parliament and with the government to strongly argue the case for Northern Ireland and to work through each of the legislative stages in parliament to eliminate the risk of Northern Ireland and its place within the internal market in the UK. "The arguments we have advanced are well understood across parliament and there is strong recognition in the House of Commons that Northern Ireland cannot be subjected to new and onerous trade barriers within the United Kingdom as the price of leaving the European Union. "The United Kingdom's long-term relationship with the European Union will need to accord with our key objectives to ensure the economic integrity of the United Kingdom," Mr Dodds said. Meanwhile, reacting to the earlier vote on the Withdrawal Agreement in the House of Commons, the Sinn Fein President Mary Lou McDonald has said she is "very very concerned" that the UK could crash-out of the EU without a deal. Speaking in Dublin, Ms McDonald said :"I had a strong sense from the beginning that a disorderly Brexit could happen by accident as much by design - simply by running out of time. And I am very very concerned that such a scenario is unfolding." She added: "We need to understand that [MPs] simply voting against the idea of a crash, does not mean that a crash won't happen." "We are perilously close... dangerously close to a very very bad outcome for Ireland."